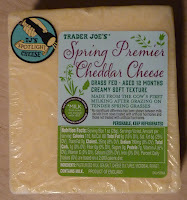 It's about high time the Rodgers clan reviewed some cheddar cheese on this blog...despite the fact that we don't know anything about cheese. I mean sure, all of us here at What's Good at Trader Joe's? are "foodie-hacks," but I think our 'Burgh-dwelling counterparts have a much higher level of expertise than we do, if only because they've braved cheeses like Chocolate Cheddar, Chile Cheddar, and Cheddar with Caramelized Onions. In light of those selections, I think you can say that Sonia and I played it safe with this one. It was the "spotlight selection" at the free sample table on our last TJ's run. The friendly gentleman behind the counter explained that the cheese came from the very first milking of the spring season, and that the grass that the cows eat at this time of year is soft and fresh and the cows are happy because the long winter is over and yadda yadda yadda this is a very special cheese. As we inhaled our samples, there was indeed a happy tingling sensation that might have come from the cheese yielded by particularly happy cows. It reminded me of an ad campaign in California that goes something like, "Good cheese comes from happy cows, and happy cows come from California." My acquaintances from Wisconsin were all thoroughly offended by this ad campaign, because, they argued, their Wisconsonian cows are every bit as happy as these chauvinistic Californian cows. It has recently been brought to my attention that cows from Vermont are also extraordinarily happy—and it dawned on me just today that they must be joyous indeed, since their milk is the milk that brings us Ben and Jerry's delightful treats. 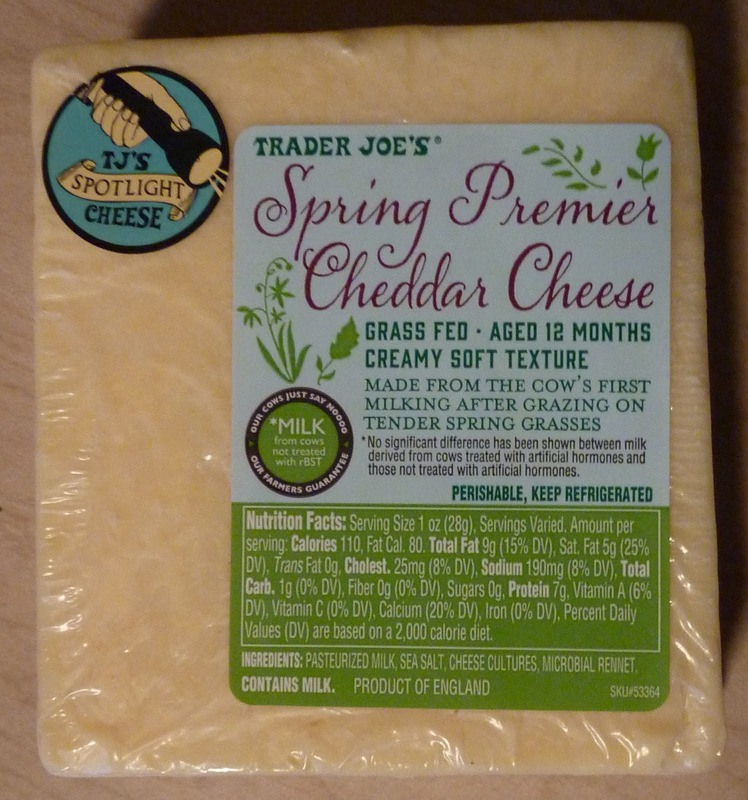 Plus, cows in my native Pennsylvania are happy (I know this because I have met some of them), and I must point out that since this product is imported from England, that English cows, too, at least in the springtime, are quite chuffed as well, I say. But back to the review. This cheddar is soft and creamy as the label suggests, and both Sonia and I felt it was on the sweet side, as far as most cheddars go anyway—but then again, we don't really know much about cheese. It reminded Sonia of the little Babybel cheddar cheeses that come wrapped in red wax. The bottom line is, we liked it. Happy cows = happy cheese = happy humans. Four stars each. The cheese is from England which is interesting.